When will be Regal Academy next episode air date? Is Regal Academy renewed or cancelled? Where to countdown Regal Academy air dates? Is Regal Academy worth watching? Despite her last name, Rose Cinderella is an average teenager who is as obsessed with shoes as she is with fairy tales. Things change when she discovers a magic key that unlocks a new world in which fairy tales come to life. After tumbling into Fairy Tale Land, Rose finds out that she has a magical family legacy -- Cinderella is her grandmother. Cinderella is the headmistress of Regal Academy, where five fairy-tale families teach the next generation of princes and princesses how to become heroes. Now, Rose is learning to use her magic and live up to her famous surname, along with new friends that include Astoria Rapunzel and Hawk Snowwhite. 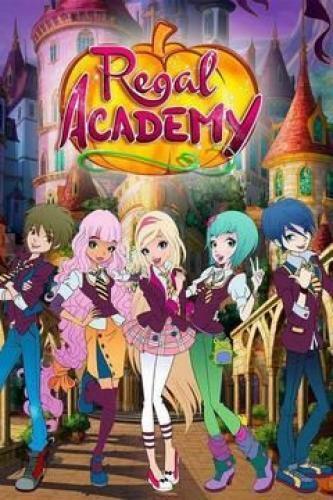 Regal Academy next episode air date provides TVMaze for you. EpisoDate.com is your TV show guide to Countdown Regal Academy Episode Air Dates and to stay in touch with Regal Academy next episode Air Date and your others favorite TV Shows. Add the shows you like to a "Watchlist" and let the site take it from there.